This is a transcript of SYS Podcast Episode 133: Writer / Director JT Mollner Talks About His New Western Film, Outlaws And Angels Starring Luke Wilson. Ashley: Welcome to episode #133 of the “Selling Your Screenplay Podcast.” I’m Ashley Scott Meyers, Screenwriter and Blogger over at – www.sellingyourscreenplay.com. Today, I’m talking with J.T. Mollner, who wrote and directed the film, “Outlaws and Angels” starring Luke Wilson. It’s a low-budget western. We talk through how he got this film produced and somewhat he’s earlier experiences writing and directing short films. So stay tuned for that. If you find this episode valuable, please help me out by giving me a review in ITunes. Or leaving me comment on YouTube. Or retweeting the episode on Twitter, or liking it on Facebook. These social media shares are really do help spread the word out about the Podcast, and are very much appreciated. Any websites or links that I mention in the Podcast can be found on my blog in the show notes. I also publish a transcript with each episode. In case you would rather read the show, or look something else up later on. You can find all the episode show notes on the website – www.sellingyourscreenplay.com/podcast. And then just look for episode #133. 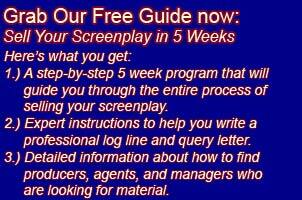 If you want my free guide, “How to Sell Your Screenplay in Five Weeks.” You can pick that up by go to – www.sellingyourscreenplay.com/guide. It’s completely free, you just put in your Email address, and I send you a new lesson every week for five weeks. Along with a bunch of bonus lessons. I teach the whole process of how to sell your screenplay in that guide. How to write a professional log-line and quarry letter. How to find, agents, managers, producers, and production companies that are looking for new material. It really is everything you need to know to sell your screenplay, just go to – www.sellingyourscreenplay.com/guide. So, I’m not deep into production of my crime, thriller, feature film, “The Pinch.” We are shooting July 9th through July 29th. So, I’m pre-recording a bunch of Podcast episodes in late June. So, I’ll be able to keep publishing the Podcast through July while I’m shooting the film. I’m going to try and put out updates through the various social media channels. So, please follow me on Twitter, and that’s www.twitter/ashleymeyers. Or like SYS on Facebook, that’s – www.facebook.com/sellingyourscreenplay. Or subscribe to our YouTube channel, which is – www.youtube.com/sellingyourscreenplay. And I just set-up a new InstaGram account, which is – www.instagram.com/ashleyscottmeyers, I will be having someone shooting some behind the scenes footage. So, I’ll try and get that posted to YouTube and Facebook as we are shooting. And I will have my cell phone and just snap some pictures. And I’ll try and publish those to Twitter and InstaGram. So, keep an eye out for all of that. And wish me luck. So, I will keep new episodes coming out through July. But I won’t be able to do any real time updates. So, check out my various social media channels for those real time updates on the shooting of “The Pinch.” And once the movie is completed, and I’ll be back and get the full wrap-up of the entire process of shooting, the film. So, that’s what I am working on. So, now let’s get into the main segment. Ashley: Welcome J.T. to the “Selling Your Screenplay Podcast” I really appreciate you coming on the show with me. J.T. : Great, thanks for having me. Ashley: So, maybe to start out? Maybe you can give us a little bit on about your background. Kinda of how you got into the industry, and eventually worked your way up to writing and directing your latest feature film. “Half Nelson.” I just thought she was very respectful towards both ends work. And she had a lot of integrity as a producer. You always align yourself, critically acclaimed interesting projects, risky projects. So, we took this movie, and her, and she tells me, “I don’t really” Before she started, “I really don’t really want to produce any features any more” She said. It’s really tough, and I’ve gotten out of that game, and your world. And she, I do have a track where I am allowed to carve out a little time to produce a movie or two, here on the side. But, she said, “I’m just really not interested in it” she said. “I’ll get out, but I don’t want to produce this.” So, we just toyed with it, she read the script, and she called me about a week later. And she said, I don’t know if this is going to be a mistake, but, I would like to produce your movie. So, that was very exciting. Rosanne Korenberg isn’t that, she isn’t an investor, she is a creative producer. And she literally helps build the blocks to the film. And I, the film wouldn’t be built the way it is, without her. Because she doesn’t have much money in her pocket to finance a movie. That’s not her role. So, we had to go get financing. And the first group of investors we approached were, she kept, she throw-out the first bit, she kept substantiating us in a major way. By being a part of the project, she was, she legitimatizes the project. She was the real producer on the film, who produced big movies. Because she, you know, she ended up closing the deal. Along on the first bit of money for the movie. And the first chunk of money for the movie was about half the movie came in very fast. We had some partners on some other projects. Some short films we did, who really believed in us, you know, as a team. And we are ready to come in with Rosanne on-board. And so, they came in, and had the first half of the money. Of course, we thought that, the second half of the money would come very quickly, but it didn’t. And we went to a lot of people and said, we have the rest of the money for you. But, we need you to have certain actors attached to this film. So, after that it was, kind of just, you know, another year. Of you know, reaching out to cast with, cast and director, Kevin on of the other producers. And the just, you know, attach the talent, but we would satisfy new investors. But, also created to satisfy me. And that was a very, you know, enlightening and interesting process. And that took about another year and Chad and I were worried. It was the first attachment, and that was such an interesting time for me. Because Chad Michael Murray wasn’t who I had envisioned for this, for the lead role in this movie. Henry the lead outlaw, is, the part is written as a 50-year old handsome and rugged old man. You know, and Chad Michael Murray is in his 30’s and looks like he’s in his 20’s. And is very good looking, clean cut guy. And he’s always been known as a “Heart throb.” And so, I was very leery about that. And he and I met together, and Chad and I just created this, our own level of charging during the reading. He really understood the script better than any other actors I had met with. And he was determined to do a career change in film. And really take a U-Turn and change his image completely for this role. And he dedicated his life to it, for 3 to 6 months. And I couldn’t be happier that he stayed earlier in the film. And I went after him, came Francesca Eastwood. Clint Eastwood’s daughter, got Francesca’s daughter. She is a bonafide movie star. She’s incredibly talented, charismatic, and we were lucky enough to convince her legendary mother, Francis Fisher to come and do a read and do a role in the film. So, that was amazing, to kind of, the cast just started coming together. And then, we cast Keith Loneker in the movie. He’s been in a lot of great films by George Clooney and he’s got a huge, really nice resume. He’s just an incredible guy, and a really good actor. Madisen Beaty wound up in the film. Master, and Benjamin Button, Myshu and now she’s on “Aquarius”, and we got Nickolas Russel in the film. Oh, and a character actor I had been working with, for years and Teri Polo of course, who’s just a legend in her own right. And Ben Browder, who is known for his Stars cape fan on Sci-Fi action hero, a true, true man character role. So, it was just, we got this cast together. And the last piece of character aboard, was Luke Wilson. Who was the last vent and element to in making the Outlaws happen. And also just, another incredible actor. Who we cast against tight roles he’s been in. And she came in and committed, and ready to go. And I was also lucky enough to have my father in the movie, playing the sheriff in the beginning of the film. So, I got my dad in the film too. So, it was just, you know, great to put the cast together and everything. We became one big happy family. Matthew Logan our photographer. Came on to shoot the movie. And this package, you know, we had the last bit of money, but this package all together made those investors happy, to say, “Okay, let’s shoot it now.” And we got to go shoot it. We shot the entire movie in three weeks. So, we started in three weeks, in Mexico and that was it. And we went to the Sundance Film Festival. Ashley: Nice. So, let’s circle back then a sec? So, let me just touch on some of the things you said about the short films. You mentioned your first short film. You raised a little bit of money? I think you said $10,000.00. Maybe you could talk about trying to get money for a short film? Typically, short films don’t make any money back. So, they are incredibly difficult to define people. Because it’s really not much of an investment. But maybe you could talk a little bit about that? How did you go about getting money for that first short film? “The Bedroom.” We were short on film, on crew, I really wanted to make a legitimate piece. And I had to raise, you know what they say? About $10,000.00 for that. So, that movie would Chris Ivan Cevic and I just wracked out brains. Just trying to figure out how to raise money for a short film? And, you know, he, we did any, every one of our short films. We pretty much did it pretty much the same way. We did that movie in “Sugar Town” and “Flowers in December” and “Henry John” and “Doodlebug.” And any number of those short films were arranged with a combination of funding and actor support. So, you know, we kinda treated it like, a company. If we could get actors involved, who wanted to work with us. We would skip the money. And we would get people involved from the film. To, a come in, and bring pieces into the funding for us. And then we also reached out to our friends in town, who wanted producer credit. Find the goodie, ya know? To come aboard, and you know, be a part of the film. We had just gotten in town, it hadn’t been hard at all. We just got creative dude. We didn’t have any funds of our own. At times it was all done through essentially “Crowd Funding” ya know. Which we got through our second movie. It was real, “Crowd Funding.” It was “Indigo Go” “Kick-Starter” and even a couple of years before those. We were using a couple of sites. We found our own legs within our networks. They were essentially Crowd Funders. You know, you just gotta be, I think, it’s like me. Say, like me, you got to have no fear, or shame. You got to be willing to walk up to people that you don’t know very well, say, invest in me, ya know? And a lot of the people who re-invest in my short film. And especially, the group who came in and helped me with half of the investment, on my first short film. Were people who wanted to produce movies. And they had movies on their resume. So, you know, we may have had one or two, but not a lot, you know? So, we said, produce our short some. Help us with the financing of our short film. We will, you know, involve you, we’ll make sure. When we move on and make features, you know? We did stay together a while. So, I think it’s just forming partnerships, building network. And really, being loyal to each other. And being true to the industry together. And look like partners early on, if you present your case like that. Ashley: Yeah, yeah. And so, how did you meet, you said, was it, Roseanne Korenberg? Who helped you produce this movie. How did you meet her, and get the introduction? I’m sure she’s overwhelmed a lot, by lots of people who want her a lot to produce a script. So, how did you get to the point where she actually took you seriously and read your script. And then got back to you? 7 or 8-year relationship. So, I just say the relationship is not important, more than anything you know? Relationships with the right people, not just with anybody. With the right people, people with integrity, people believe in what you do. Ashley: Yeah, yeah. And so, let’s back it up, just before that. You talked about this script. You know, when you contacted Roseanne. It sounds like you already had a manager and a lawyer. So, maybe you can talk a little bit about how you got your manager from the first time. What was the function of doing all these shorts and submitting shorts to him? He took an interest because he liked them. How did you actually get that manager? J.T. : You know, I came to town, like I said, in 2005, and I was actively, I had about ten people who had moved to town, around the same time I did, from Las Vegas Nevada. And when I came out here, my first goal was to get representation, everybody wants representation. And I knew that a manager should come first because a manager, will help you get an agent. And I knew one day I would need a good agent. So, I had friend who was an actress, who had some early success when she first came out here. And got some big roles right off the bat along the way. And she was rep’ed by a manager. Who represented actors as well as writers. So, I faithfully asked her for an intro. To her manager, and that was Nicholas Terry. And the talent group he was representing, was Helen Scarsdale, and Fred Willard, and a number of interesting guys. And I went in and had a meeting with him. And he actually, you know, wanted to read one of my scripts. And he read it. And he said, “Well, I’ll help you get this made.” And I said, “Well, you can’t be involved in the movie unless you manage it?” So, I kind of goaded him into it early on before I had anything going for me. And so I signed with him then. And he’s still my manager now. So, all the craziness now, a lot of changes over the last, you know, decade. And he’s a trusted confidant. So, I think, once again, you know, relationships. It was relationships with the ones I knew was working. Ask people to introduce you. They’re ups people who don’t feel like you’re doing something. They are, feel like you’re key with them. Find people whom you trust. Whom you don’t feel threatened by, and have them introduce you to their contacts and help you out. Not only will you get through the Hollywood thing without allies and without help. Ashley: So, do you have a release schedule for “Outlaws and Angels?” Do you know when they’ll be hitting TV and Theaters and stuff? J.T. : Yeah, I love “Angels”, it is coming out in theaters on July 15th 2016. J.T. : So, it will be out in less than a month. And you can look it up online. I think we’ve got city selections playing at, 11 cities, and New York of course. And then 9 other major cities. And it will be out on DVD about a month later. But it will be simultaneously out of ODO, on Amazon. So if you’re not in one of the cities that it’s playing? You can order it. However, I would recommend if you are near any of the cities it’s playing? And try and make it there. Because we shot it in 35mm film. A few are on screen prints to Steve Belamy, who’s President of Kodak. Annette Bail, and Sasha Wrights over there, they’ve been really, really great allies of ours. And so, you’ll be able to see it maybe on a film print. And definitely maybe even, if not on film print. You’ll be able to see 35mm celluloid captured, projected on a big screen. And we underscored the film, it’s got a really nice grainy texture. And it really feels like a movie that’s pulled out of a vault. You kind of patterned it after, the look of the movie after Aultman’s Masterpiece, later Mrs. Miller. We really wanted it to look like an old photograph. We really took care, and I think we achieved that. So, I think it’s a little. It’s a really good experience to shoot this from the big screen. I really hope people make it to the theaters to see it. Ashley: Yeah, yeah. For sure. So, I just like to wrap up the interviews by asking the guest to just share his Twitter handle, or Facebook page, or whatever you feel comfortable sharing? For the people who want to just follow along and keep up with your career. J.T. : Yeah, of course. You can follow me, my personal page on Twitter, @jtmollner, that’s j-t-m-o-l-l-n-e-r. And I pretty much only talk about film on this. So, if anybody follows me on that? I’m also on, my production company is on Facebook. J.T. Mollner’s No Remake Pictures. It’s my production company name. With, “No Remake Pictures.” And all the information on how “Angels” as well as information on casting, crew-up and all that stuff, career announcements. And all that stuff on Facebook, and Twitter page first. And then of course there’s – www.noremakepictures.com, which is our website. Ashley: Perfect, perfect. I will write all that up in the show notes. So people can click over to it. J.T. I really appreciate you coming on and talking with me today. And thanks for the interview, I wish you luck with this film. J.T. : Thanks so much I really appreciate it. I look forward to, talking to you again. Ashley: Thanks we’ll talk to ya later. Ashley: A quick plug for the SYS Screenwriter Analysis Service. It’s a really economical way to get a high quality professional evaluation on your screenplay. When you buy a 3-Pack, you get an evaluation for just $67.00 per script for feature films, and $55.00 for tele-plays. All the readers have professional experience reading for: Studios, production companies, contests, and agencies. You can read a short bio for each reader on our website. And you can pick the reader you think is the best fit for your script. Turn-around-time is usually just a few days, but rarely more than a week. The readers will evaluate your script on 6 key factors. Over all kraft – Which includes – Formatting, Spelling and Grammar. Every script will receive a grade of – Pass, Consider, or Recommend. Which should help you roughly understand where your script might rank if you were to submit it to a production company or agency. We provide analysis on features and television scripts. We also do proof reading without any analysis We also look at a treatment or outline and give you the same analysis. So, if you’re looking to vet some of your project ideas? This is a great way to do it. We will also do a log-line and synapsis for. You my add this service to an analysis, or you can simply purchase this service as a stand alone product. That’s the show, thank you for listening.